A peace dove theme emerged as we worked on the cabin, and you'll see several fair trade, handmade dove items inside and out. The cabin's little meditation room is the perfect place to sit in the quiet of this place. The cabin comes complete with a picnic table, fire pit and a separate cabin with a sink (spring-fed) and a top-of-the line composting toilet. From Dave: I've been hooked on natural clay plasters for years. 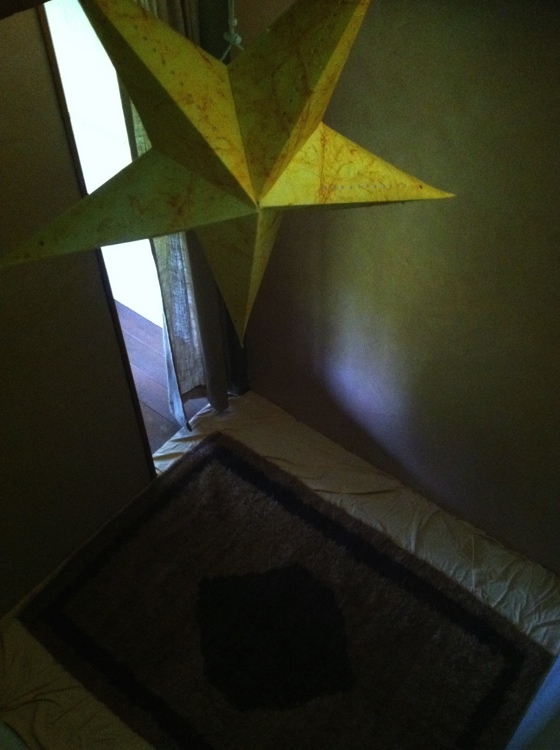 Here is a shot of the cabin mid-way through spreading American Clay plaster on the main room's wall behind the futon. I love the warmth and earthy beauty of clay plasters, and their glistening sparkle in the lamplight is pure and natural magic! Finally, an off-grid cabin that is so intimately connected to nature that you'll hear and feel the breeze, watch deer walk past your window and settle into an Amish-made porch rocker for a front row experience of Ohio country. Our rustic cabin by the pond is available as lodging from late April through mid-October. This sweet area includes a porch with comfortable chairs, a picnic table and a firepit. Plus, it is right beside our spring-fed pond and tucked far enough back on the property to help you go deeper into your retreat. This simple cabin sleeps up to 3 - 4, and has a main room with a queen-sized bed and a small bedroom with bunk beds. A third small room has been dedicated as a space for meditation and prayer. Multiple walls are finished with natural clay plaster, which gives it a warm, earthy feeling. The state-of-the-art composting toilet is in a small cabin just a few steps away from the pond cabin. 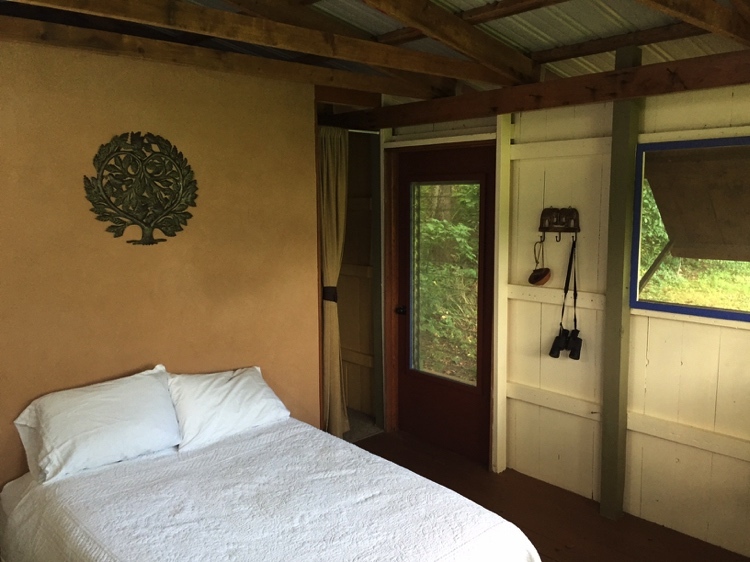 Guests staying at the pond cabin are provided with time to use the hydrotherapy shower in the main house or choose to use the outside, private shower by the house. The cabin has a beautiful quiet to it, and you won’t hear the buzz of electricity. Amish-made, battery-powered lights are provided. Walk the country roads, sit on the porch and enjoy the wildlife - let yourself slow down.